Only four more days until Christmas!! I am in full holiday panic mode! This post will be a quick one because I am feverishly trying to get everything purchased, wrapped, and just plain under control before the weekend festivities over take us. My personal goal this year is to not be wrapping gifts on the night of Christmas Eve. This year I'm a little more behind than normal. I don't know why? I'm not sure if it's the snow that threw us for the loop, or the fact that the kids have 5,420 events to participate in, or perhaps Mr. Cute taking a man-cation right in the middle of it all. Take your pick. So, I didn't actually begin to do my holiday shopping until late last week. And by shopping I mean several late night dates with me, a glass of wine, and my computer. Thank the good Lord for Amazon Prime. I saw this idea on Pinterest and thought it was totally fitting considering my UPS, FedEx, and USPS delivery people were about to have a very close relationship over the next few days. Not to mention I feel all sorts of guilty each time crosses our yard/driveway. It's been pouring rain lately and they are getting soaked on their mission to bring my loved ones a little holiday cheer...or that pair of socks that they never knew they didn't want. I saw people create little gift baskets with little treats and drinks to thank the holiday delivery crews for all of their hard work. I thought this was genius and I wasted no time in creating one of my own. And because I'm me, I created a little label to attach to all the goodies. 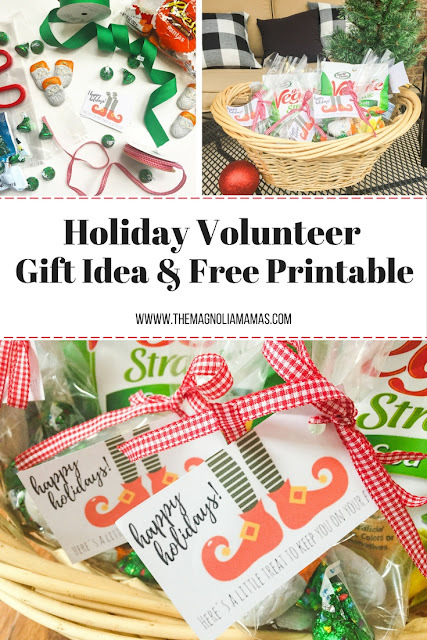 It can be multi-purpose, but I thought it was perfect for all my holiday helpers. Download the "Here's a Little Treat to Keep You on Your Feet" printable. I pulled together some of our favorite holiday candies, some of our favorite snacks, and mixed in some bottled waters and sports drinks. I packaged everything up, leaving some snacks loose just in case of allergies or personal preferences. I attached the treat printable to various items and put it all in a little basket. Then I placed the basket on my front porch, and done! Such an easy way to say thank you! Here's hoping it brightens up their day, and maybe kind of sorta makes up for the physical therapy they are about to need from my late night ordering sessions. 'Tis the season!